BIAFRA: SELL-OUT MEND CLAIMS OWNERSHIP OF TRIPOB AND RE-IPOB AS VANGUARD BECOMES THE SPOKESPERSON. In Vanguard’s unquenchable thirst to frustrate the restoration of Biafra, it has again, today, 3rd September 2016, published another tale, still targeted at misleading the public and to keep these non-existing groups: The Rebranded Indigenous People Of Biafra (TRIPOB) and Reformed Indigenous People Of Biafra (RE-IPOB) alive in the minds of Nigerians and the world at large. In Vanguard’s bid to cover up for her vapid plans to burn Biafran flag on October 1 2016, which would have indicted Nigeria, it said, ‘’following appeals by well-meaning Nigerians across the world, especially civil war veterans of the defunct Biafra Republic, TRIPOB shall no longer burn the flag of the defunct Biafra Republic as earlier planned for October 1, 2016, a date which has also been rescheduled. Recall that Vanguard had earlier lured some reputable Biafrans like Dr Arthur Nwankwo and Prof Nwankwo Nwaezeigwe. These individuals rained insults on Vanguard for associating them with such ‘’amorphous’’ group while they charged them (Vanguard) to retract their names from such deals to avoid ‘’unpleasant consequences’’. 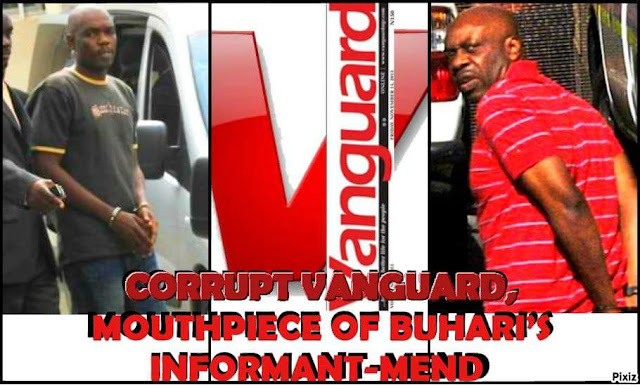 Vanguard, who has since this recent propaganda failed to produce their invisible Spokesman ‘’Chima Effiong’’, has again gone back to appoint a notorious criminal who was involved in several kidnappings of foreign oil workers and the masterminded the October 1 2010, bomb blast in Abuja, as the leader of this imaginary group. Vanguard is the only media house that knows the structure, mission and vision of TRIPOB & RE-IPOB; Vanguard is the only media house that holds press conference with this invisible group and in addition, has assumed the office of their Spokesperson. Nigerian Government should build more psychological hospitals to accommodate more lunatics if an incarcerated criminal like Charles Okah would be an option to be considered in issues as significant as Biafra agitation. Gbomo Jomo a.k.a. Charles Okah is making a fool of the Movement for the Enslavement of Niger Delta (MEND) by cleverly conniving with the Yoruba dirty media and the Hausa-Fulani political bigots to keep Okah’s name in the press. According to Biafra Intelligance Team (BIT), Gbomo Jomo is hoping to appeal to the stupidity of Buhari to prevail upon South African government to release Henry Okah for the flag handover ceremony. It is now established that MEND, via this perfected art of treachery, is working hand-in-hand with the Hausa-Fulani government of Nigeria to further enslave the Niger Delta and now wider Biafra. This is a proof that these bands of criminals (MEND) are unrepentant. Yoruba media handlers should have told Charles Okah that informants all over the world remain in jail for their own safety or they are dead. IPOB IS ONE AND UNITED UNDER THE SUPEREME LEADERSHIP OF NNAMDI KANU.